We’d all love skin that glows with health, inside and out. To mark National Healthy Skin Month, we asked Hayley Goldbach, MD, UCLA dermatology resident, to share her top tips for healthy skin. 1. Start from the inside. Good overall health equals good skin, so cover your bases: Eat a healthy diet rich in fruits and veggies, get enough sleep and engage in regular physical activity. 2. Protect your skin from damage. Sun protection is vital for reducing your risk of skin cancer, and also keeps your skin looking youthful. Goldbach recommends wearing daily sunscreen (with an SPF of at least 30) every day, and reapplying every two hours if you’re out in the sun. “SPF is one of the best, proven anti-aging ingredients,” she says. You can also limit harmful rays by wearing hats and long sleeves and avoiding the sun between 10 am and 2 pm. “And remember to account for less obvious sources of sun exposure, such as time spent in a car,” she says. 3. Banish dry skin. Moisturizing is a must for all of us, Goldbach says, but it becomes especially important as we age, when skin tends to become drier. “Moisturizer gives skin a firmer, more youthful appearance, and also reduces flakiness,” Goldbach says. She recommends moisturizing day and night, making sure to use a moisturizer with SPF in the mornings. And don’t forget body lotion and lip balm to lock in moisture from head to toe. 5. Go easy. Many people over-wash their faces, scrubbing with abrasive cleansers or scouring with a washcloth. That harsh scrubbing can actually irritate skin and may trigger acne. Instead, use a gentle cleanser to remove dirt and oil and gently pat your skin dry. “You shouldn’t be punishing your skin,” Goldbach says. 6. Consider upgrades. It’s easy to be tempted by fancy creams and serums, but many of their ingredients haven’t yet been proven effective, Goldbach says. The big exceptions are the retinoids, a family of compounds derived from vitamin A that reduce fine lines and dark spots. 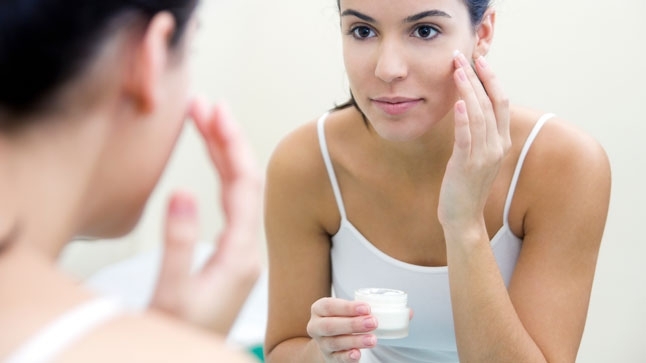 Look for the ingredient retinol in over-the-counter creams. A dermatologist can also prescribe a stronger retinoid formula. 7. Ask an expert. When it comes to skin, there’s no one-size-fits-all system, says Goldbach. “If your basic regimen isn’t working, it’s time to see a dermatologist and talk about specifics for you and your skin type.” Prescription medications can help you fight acne and reduce signs of aging. Visit UCLA Dermatology to learn more or to make an appointment.